SAP Custom Code Management is an approach to create and maintain value-added custom coded extensions in SAP environment for customer specific business processes needs, during the whole lifecycle of all Custom Code Objects. 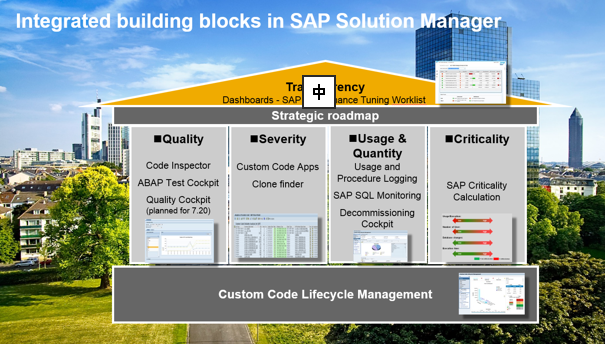 You can take advantage of the SAP Custom Code Management to manage your custom code efficiently and effectively and be ready for adapting the business transitions, innovations and upgrades. 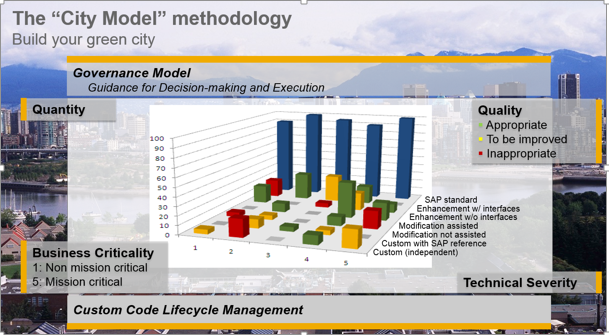 The innovative concept of Custom Code Management from SAP provides comprehensive insight on how companies can efficiently and effectively manage their home grown Custom Code for the complete custom code lifecycle. From planning to retirement, it delivers transparency on Custom Code objects, automates the analysis of every change and clearly identifies their usage, utilization and business impact of the customer objects. It also supports optimization cycles with a project based approach to reduce the Custom Code footprint. Custom code including enhancements and modifications that exist in a company’s SAP system landscape can be evaluated in four dimensions. These dimensions are quantity, quality, technical severity and business criticality. The goal is to establish a constant evaluation process of custom solutions in these four dimensions, to optimize them on the basis of the results that were obtained and in alignment with the goals that have to be achieved.